Your new Bulletproof snack option is here! Bulletproof Chocolate Fuel Bars are made from our best organic, raw Upgraded Chocolate Powder and Cacao Butter. Sweetened with non-GMO xylitol, Chocolate Fuels Bars are sugar-free and a low-glycemic alternative that works anytime of the day. 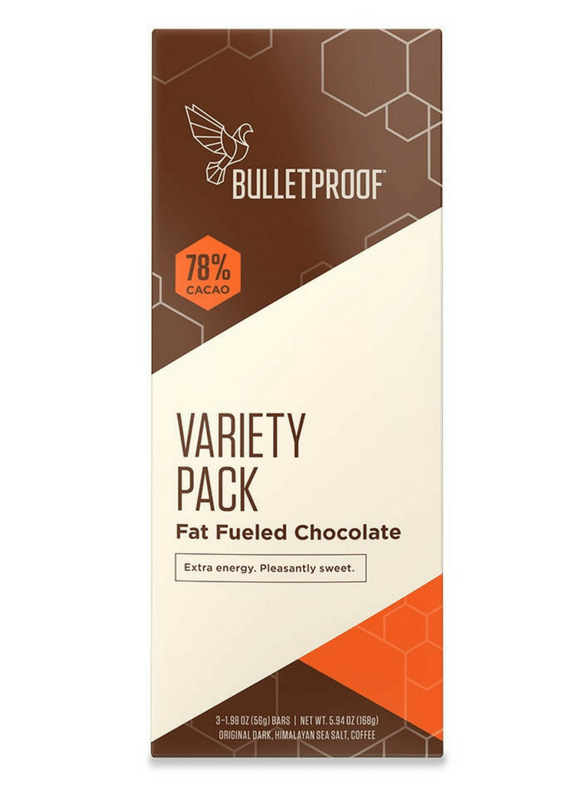 Experience the Bulletproof Lifestyle with high quality, tasty, chocolate bars that will not slow you down. Upgraded Coffee Bar – Upgraded Chocolate Powder (Organic Raw Cacao Powder), Upgraded Cacao Butter (Organic Raw Cacao Butter), Xylitol (Non GMO from North American hardwood), Caprylic and Capric Acid Triglycerides (Bulletproof XCT Oil), VanillaMax, ground Upgraded Coffee. Himalayan Sea Salt Bar – Upgraded Chocolate Powder (Organic Raw Cacao Powder), Upgraded Cacao Butter (Organic Raw Cacao Butter), Xylitol (Non GMO from North American hardwood), Caprylic and Capric Acid Triglycerides (Bulletproof XCT Oil), VanillaMax, Himalayan Sea Salt. Original Dark Bar – Upgraded Chocolate Powder (Organic Raw Cacao Powder), Upgraded Cacao Butter (Organic Raw Cacao Butter), Xylitol (Non GMO from North American hardwood), Caprylic and Capric Acid Triglycerides (Bulletproof XCT Oil), VanillaMax.